Van Lennep Kliniek offers laser treatments in The Hague with a class 4 medical laser. This device offers options for both IPL (flash lamp) and laser. This medical laser is very reliable, safe and effective. The treatment with the Fractional Laser is aimed at reducing or removing pigmentation spots, acne scars, wrinkles, couperose, rosacea and stretch marks, and at rejuvenating the skin in the face or elsewhere on the body. The laser has different settings and comes with various hand pieces. This makes it possible to treat pigmentation spots, reduce blood vessels and redness, but also improve the skin itself. The skin-improving laser stimulates both the renewal of the epidermis and the production of collagen in the dermis. This reduces fine lines and scars caused by acne, for example, and improves the skin’s volume and elasticity. The result is beautiful, young and fresh-looking skin that also feels more hydrated and elastic. Very suitable for face, neck and décolletage. 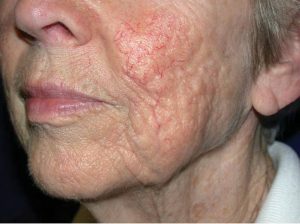 The painless and safe Clearlift laser treatment (also known as cold laser treatment) ensures the production of new collagen, which results in a tight, rejuvenated skin. Basically, this special laser beam provides a facelift without damaging the skin. 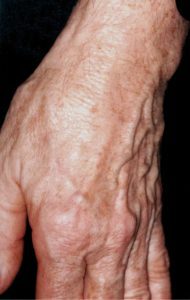 Wrinkles fade and imperfections disappear. The cold laser treatment offers an excellent alternative to Botox or fillers. A Clearlift laser treatment is suitable for face, neck and décolletage. You can already see results after 1 treatment. A course of 3-6 treatment sessions, with one treatment every other week, offers optimal results. You can then follow up with maintenance treatments once every x number of months. In principle, this treatment can be repeated endlessly. A single laser treatment takes about 20 minutes. Immediately after the treatment your face may feel a bit warm, but you’ll instantly look presentable again. Feel free to stop by our clinic in The Hague or Oegstgeest and inquire about the possibilities! The treatment with a laser is somewhat painful but most patients tolerate the laser treatment well without anaesthetics. The treatment feels like warm ‘pricks’ on your skin. Before and after the laser treatment it’s important to not expose yourself to too much sunlight and to use a sunscreen of SPF 30 or more, which is available at our clinic. You should be aware of the fact that when your skin is treated with a laser, you may experience some swelling, redness or darkening of the skin for a few days. Of course we’ll offer you guidance to deal with that. Please read our Lasertreatment aftercare client instructions. 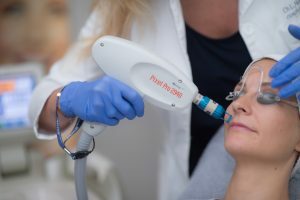 How many laser treatment sessions are needed? A single treatment already gives a great result, but for an optimal result 4 treatment sessions are needed on average. The number of sessions required depends on the condition of your skin, among other things. The result will usually be maintained for years. Of course, your lifestyle is a significant factor in this regard. 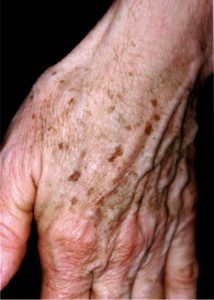 Smoking, poor eating habits and excessive exposure to the sun or tanning bed worsen the condition of the skin. The healthier your lifestyle, the longer you will enjoy the results of your laser treatment. During the consultation, the doctor will determine which approach is best for you. You’ll also be informed about the frequency of treatments and the total cost. Marianne from The Hague, 63 years old Laser treatment 1 “The treatment went better than expected”. The burning sensation that I felt at the end of the treatment was already subsiding later that day. My skin felt dry, a bit like sandpaper. I have applied the soothing cream, as advised, and that made it feel better immediately. Some light crusts were formed on the pixels. Three days after the treatment the redness had disappeared. Every day I was able to camouflage it very well with the mineral make-up of Jane Iredale. Some skin flaked off as well, “great, I’m getting new skin!” After a treatment you quickly start to see results, your skin is getting tighter. I’m happy with it, will let you know more in a few days, when the dark spots [old skin] are gone…. 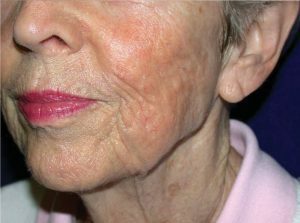 Laser treatment 2 This session after 4 weeks was more sensitive than the first one, the deep neck wrinkles were given an extra treatment. The redness and burning sensation lasted longer and the treated spots were a bit harder to camouflage. After 5 days the redness was gone and my skin is now peeling, I’m very happy with the result. My neck is now definitely looking much younger and the skin is tighter! Call 070-737 00 88 Or send us an email via Info@vanlennepkliniek.nl.